This spring, I’ve had the pleasure of collaborating with Walmart on their #WeDressAmerica campaign. Let me be the first to say Walmart has totally stepped up their game in the fashion arena, and I’m so excited to bring you another adorable, affordable head-to-toe look today! One style I’ve been loving this spring are billowy, blousey long sleeve tops. They look effortless, elegant, and super chic… not to mention, they’re so easy to style! 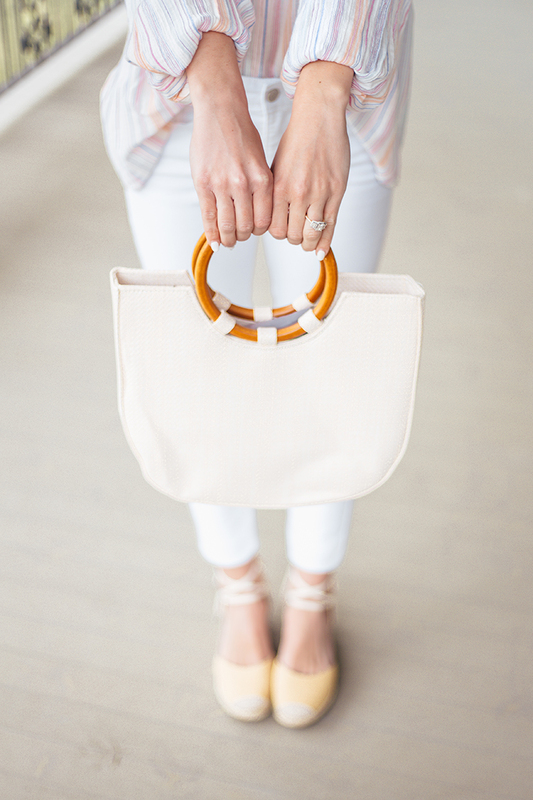 Throw on white jeans and wedges, and you’re set. 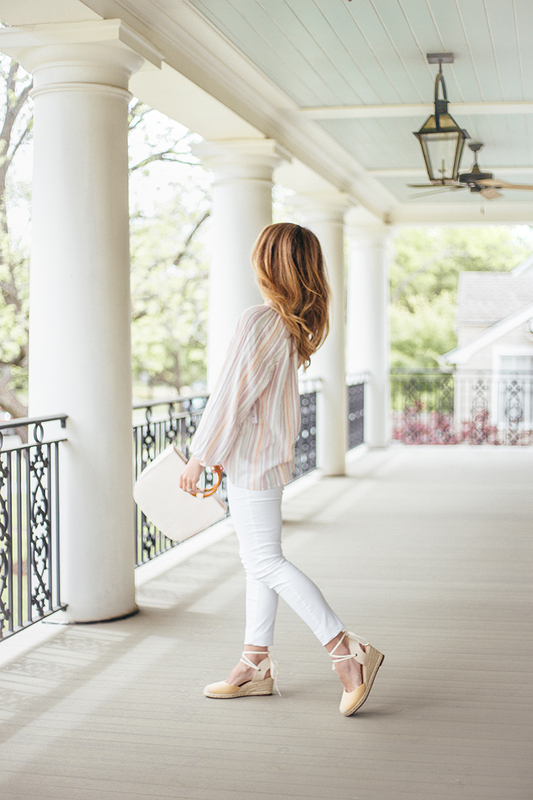 This pastel, striped piece is just $11, and has that roomy feel I love! I loved complimenting the pretty spring hues in this blouse with these pale yellow espadrille wedges. They’re only a couple of inches high, so they’re really easy to walk in. 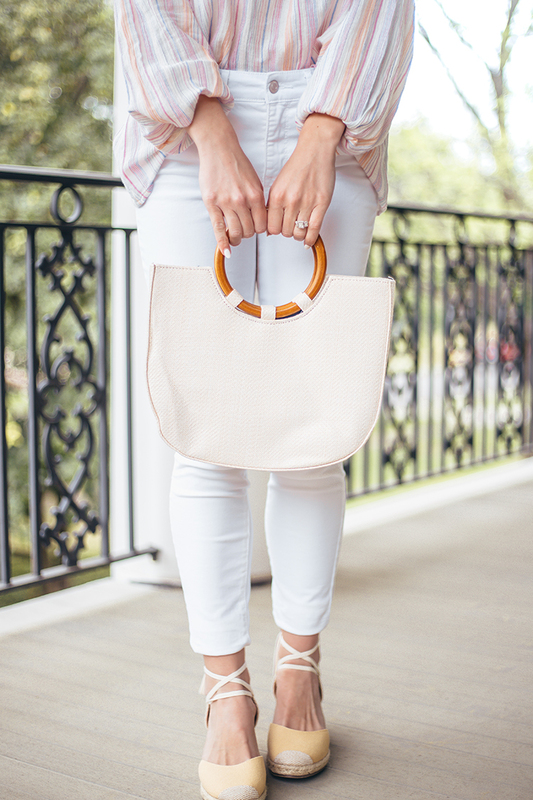 Plus, they come in three other colors, and are priced at under $50! Here are a few other amazing Walmart finds I’m loving. There’s no better feeling than scoring an amazing style at an amazing price, and I love that I can consistently do that with the fun new offerings at Walmart. Check out the entire collection and see for yourself here! Thank you, Walmart, for sponsoring this post. Gorgeous outfit! Walmart doesn’t ship to my country but it’s still nice to see outfits for inspiration. Thank you so much, Marta! I’m with you… I always love a bit of inspiration! I ordered the denim dress in your last Walmart post and it just arrived. It’s adorable and surprisingly light weight. With the sleeves rolled up it will be a perfect dress for a casual day of errands, a fall football game “Go Gators” or dressed up a bit with the right shoes and accessories for dinner out. Can’t wait to wear it!